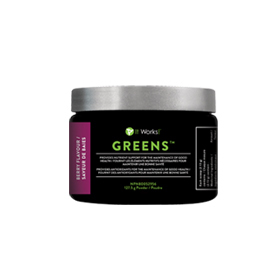 [IW_Product product_name=”Greens Drink Powder” manufacturer=”It Works Global” product_id=”CA360″ retail_price=”80.00″ loyal_price=”48.00″ description=”Start your day with a healthy blend of fruits and veggies to help you stay energized, while adding nutrients and antioxidant support to your daily diet.”]Click Here to Order Online! Combating acidity is done best by the right amount of raw fruits and vegetables. It Works Greens contains 8+ servings in a convenient daily dose. Greens might be green, but tastes like orange. The flavor is similar to Tang so it goes down easy. It is easy to use and dissolves quickly in juice or water. All of the minerals and vitamins in the Greens invigorates the body with a natural energy boost. With a boosted pH-balancing blend, added probiotic support, a new berry flavor, and a larger size that’s perfect for sharing. Greens blends 38 herbs and nutrient-rich “superfoods” to provide vitamins, minerals, phytonutrients, and enzymes in their naturally-occurring, bio-active, bio-available form. New larger size for three times the Greens! Greens contains Gluten, soy, milk and wheat. All ingredients non GMO.